Kinda dissapointingly ironic to be checking into the Peninsula now that the Bourne crew has checked out! Rotten timing! ...and just as I was whining about missing the Bourne gang, I bump into the cast & crew of the French Amazing Race! I'm assuming from the timing that he saw the cast and crew at the Peninsula Hotel. I believe the next in the series of Jason Bourne movies has been shooting in the Philippines and that is what he is referring to as the Bourne Gang and Crew. The Peninsula Hotel is about 400-500 meters away from where they were shooting, so if the Ayala Triangle was the pit stop, the Peninsula would be a likely place to have everybody stay. Though, as a 5 star hotel, it probably isn't cheap to stay there. In that case, he could have dropped his bags in his room and left the hotel and seen them in the park. do you know who are coming back this time? Well there's Ludovic & Samuel from PÉ6, and maybe Marcelle & Nicole (doing the confessionnal?) and Jacky & Alexia from PÉ4, who all seem to have survived through the penultimate Philippine leg. Really? How come I did not see them? Manila Cathedral is inside Intramuros so I think it's a possible location. From the news stories, this is supposed to be the last day of filming in the Philippines and I believe they are headed for Australia, so it makes sense they would be filming somewhere in Manila today as the first part of the leg before they leave the country. @lenggables di ko sure eh, basta french version ng amazing race daw. 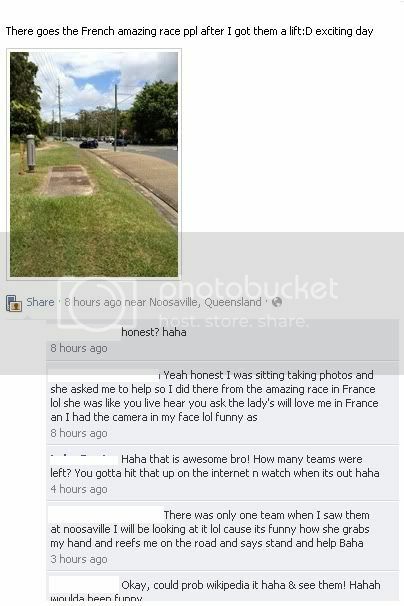 Google translation: I sure eh, just French version of the Amazing Race Daw. @lenggables kaya nga eh. Intense pa naman labanan sa amazing race. Google Translation: so eh. Intense fighting also on the amazing race. @lenggables yun siguro yun, check mo yung pics na shinare ko. Galing kay ninong Ed. Google translation: maybe yun yun, I check my pics shinare. From Ed's godfather. I did some research on Sarao Motors and found out that it's a factory in Las Pinas that makes jeepneys, the colorful small buses that provide local public transportation in much of the Philippines. I also found about 165 pictures taken during the setup of the leg and while the teams were running the leg. An absolutely amazing find! This is the good news. Now for the bad news. Unfortunately, I was at work and couldn't deal with that volume of data. So, I recruited a couple of helpers, who also proved to be at work or otherwise busy. By the time we were able to tackle grabbing all the pictures, they had been taken down. We did end up with 5 pictures that I'll post below, but what we didn't get was MUCH MUCH more interesting. I feel kind of bad, because that was about the best find I've made here for RFF and I let it get away. I dropped the ball when I didn't try getting some of the best ones when I had the chance after work. Anyway, from the evidence in the pictures, the race was down to four teams at this point. The jeepney construction yard was set up with a number of items like old tires and colored ropes were threaded around, under and through the items. One person from each team appeared to be following the ropes over obstacles that included at least one teeter totter like board. Whether they were threading a ring along the rope or trying to unsnarl and free their color rope (red, green, blue and yellow I think), I couldn't say. The person doing the task was also carrying a big sponge for some reason. After they finished that, they moved back towards the entrance to the yard and helped push a jeepney out into the yard where a large crowd of people climbed on board, filling it to capacity and then some. Each team appeared to hop on to the back of the jeepney and hung on as the jeepney left the factory for some unknown location. The camera and sound guys followed as passengers on motor scooters being driven by local drivers. The pictures we got are from the setup before the leg. I will mention that there were 4 or 5 pictures that appeared to show debris high in the air. I'm guessing those were balloons or kites over the yard. Whether they factored into the task, I don't know. the amazing race..is in ayala triangle yesterday..tryin to hitch in prv8 car.. n peepz thought itz sh00ting of Bourne legacy..hahaha! Hopefully some of you who follow the show will recognize this team. They do look familiar. The woman tweeting is tweeting in Filipino, but I can't figure out where in the Philippines she is. Is that Jean-Pierre & François?!?! Anyway all of this is an awesome find!! You have other pictures of Ludo and Samuel? I think I've found a couple of sightings of Pekin Express south of Brisbane, Australia on Facebook. I'm a bit puzzled because I thought the final leg was in Sydney and they are 800 km (500 miles) to the northeast of Sydney. It does appear that they are asking people for rides, so that would go along with hitchhiking, as I understand they do on Pekin Express. It could also be the Norwegian TAR though. Or something local that we're not interested in at all. Lol was gonna say that Kane! Nimbin is notable for the prominence of its environmental initiatives such as permaculture, sustainability, self-sufficiency as well as the cannabis counterculture. Writer Austin Pick described his initial impressions of the village this way: "It is as if a smoky avenue of Amsterdam has been placed in the middle of the mountains behind frontier-style building facades. ... Nimbin is a strange place indeed." Nimbin has been described in literature and mainstream media as 'the drug capital of Australia', 'a social experiment' and 'an escapist sub-culture'. Nimbin has become an icon in Australian cultural history with many of the values first introduced there by the counterculture becoming part of modern Australian culture. Yatala is a suburb in the outer northern areas of Gold Coast City in Queensland, Australia. It is 39 km (24 mi) south of Brisbane. Facebook has the Sighting 2 guy who saw them in Yatala listed as being near Melbourne, which puzzled the guy. Don't know where sighting 1 happened. That's got me confused too. Maybe some kind of weird connection between legalized marijuana in Amsterdam and the marijuana culture in Nimbin? It is the Dutch version of TAR. It still seems pretty far fetched to me. Do you know where the poster was from? Lismore? Gold Coast? One person was at Yatala, the other didn't say where he was. I was trying to figure it out from his earlier messages, but couldn't. I may try again later. OK, here's two more sightings around Brisbane from Facebook. Both of these are earlier than the sightings above. This person works for Singapore Airlines at the Brisbane Airport. She says it was a pitstop, but I doubt that's the case. More likely it was their arrival from Manila. That certainly would be a first if they had a pitstop at an airport, especially the final one. I can't find an Emumdie in Australia (or anywhere else). The guy who sent this lives in Noosaville, a suburb of Noosa. Noosa is located about 130 kilometres (81 mi) north of Brisbane in the Sunshine Coast region of South East Queensland, Australia. I do get hits for Eumundi, which is not far from Noosa. Eumundi is a small town with 1700 residents in the Sunshine Coast hinterland in Queensland, Australia, 21 km south-west of Noosa Heads and 118 km north of the state capital, Brisbane. It looks like they went north of Brisbane after leaving the airport and have then gone south of Brisbane. I was just about to post that lol. I found it on one of my friends friends while checking out a photo of theirs, what a coincidence! ETA: I'm surprised they have been visiting my favourite area in all of QLD, hopefully they went to Kilcoy, hehe. Good find, Aussie! I've been trying a new of looking for stuff on Facebook (new to me anyway) tonight and it's working pretty well. I didn't find what you found though. You should pass where you got that on to Georgiapeach, but her inbox is full right now. Hello, did you know what kind of team it was? man/woman? man/man? woman/woman? maybe they told you there names ?